"Greensboro, NC – Greensboro Junior Chamber Chairman John Nosek announced that the Taste Carolina Wine Festival will be moving locations and partnering with the Greensboro Coliseum at White Oak Amphitheatre this October. Tickets are on sale now at www.ticketmaster.com, Ticketmaster outlets, charge-by-phone at 1-800-745-3000 and the Greensboro Coliseum box office. 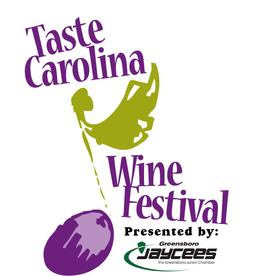 The event will feature a number of Carolina wineries sampling and selling their wines. Tickets will include one festival branded wine glass for sampling. Taste Carolina Wine Festival will also include live music and a variety of local vendors showcasing and selling their products. Over the past 13 years, the event has been held at the Triad Farmers Market. With a new committee leading the charge, White Oak Amphitheatre was selected in order to enhance exposure for the participating wineries, centralize the event closer to the developing downtown and increase overall attendance. The Committee, which includes Craig Langmeyer, John Riley, Michael Boyer and John Nosek, has decided to partner with the Greensboro Coliseum to better showcase the quality and complexity that North Carolina wines have to offer. The Greensboro Junior Chamber (Jaycee’s) has opted to donate proceeds from the event to the Make-a-Wish Foundation of Central and Western North Carolina and to The March of Dimes. The Greensboro Junior Chamber is a local chapter of the North Carolina Junior Chamber. The organization works to develop leadership skills in young professionals, ages 18-40, looking to make an impact on the community through volunteerism, charity and professional development. With 77 years of service to the community, the Greensboro chapter has been recognized as the best chapter in the world on two occasions."